Articles which include mark-up for one or more Geo microformats. See the microformats project for background (Note: articles using infoboxes or taxoboxes which generate an hCard microformat will not be listed here; see Category:Templates generating hCards and Geo). Pages in category "Articles with Geo"
The following 200 pages are in this category, out of approximately 13,498 total. This list may not reflect recent changes (learn more). The A15 is a major road in England. The road restarts 10 miles east, and north past Barton-upon-Humber. According to the AA, the route is 95 miles long, Norman Cross – Bourne takes 33 minutes, Bourne to Lincoln takes 46 minutes and Lincoln to the Humber Bridge takes 54 minutes. A section of the A15 provides the longest stretch of road in the UK. The A15 is Peterboroughs main connecting road from the south to the A1, joining near Stilton and it begins as London Road at junction 16 of the A1 with the B1043 in Cambridgeshire and the district of North West Cambridgeshire. From here to Yaxley it passes the Norman Cross Hotel and follows the City of Peterborough and Cambridgeshire boundary and it enters the City of Peterborough near Hampton Vale on the left, and meets the A1260 The Serpentine, which leads to two much faster routes around Peterborough. Next is a roundabout for the Cygnet Park business park on the left and it enters Old Fletton near the headquarters of Hotpoint to the left. There is a junction with the A1129 and it crosses the East Coast Main Line. It passes Peterborough United on the right in New Fletton and it meets the start of the A605 at a roundabout and crosses the River Nene. It follows the East Coast Main Line and becomes Lincoln Road and it passes four roundabouts, crossing the Peterborough to Lincoln Line. The route on the east side starts at the Eye roundabout with the A1139 at Newark, follows the dual-carriageway Paston Parkway, both routes head through Werrington before joining again at Glinton with the roundabout with the B1443. It passes Etton and meets a roundabout with the B1524, B1162, just south of the Welland Gate roundabout on the A1175 and B1166, it crosses the River Welland so entering South Kesteven in Lincolnshire. The roundabout marks the end of the £7 million 4-mile Market Deeping bypass. The A15 and A1175 roads are now merged in a 1-mile dual-carriageway stretch and it meets the B1524 at a roundabout and heads to the left as Peterborough Road Bourne Road and Deeping Road. North of Baston is the Waterside Garden Centre close to where it meets the north-south Roman Road King Street and it goes over the River Glen at the point it is crossed by the Macmillan Way, at Kates Bridge. The A146 is an A road that connects Norwich in Norfolk and Lowestoft in Suffolk, two of East Anglias largest population centres. It is around 27 miles in length and has primary classification along its entire route and it is mainly single carriageway throughout its route, with the exception of a section of dual carriageway on the southern edge of Norwich. The A146 begins in Norwich before passing through a rural area on its route to the eastern edge of Lowestoft. The A146 starts to the south of Norwich city centre as part of the city ring road. It begins at a junction with the A140 Ipswich Road and forms a section of the road which is approximately 1.5 miles long, running to the east where it reaches a junction with the A1054. Before the construction of the bypass the A146 began in the centre of Norwich. After leaving Norwich the A146 returns to a single carriageway and runs through a section towards the town of Beccles on the Norfolk-Suffolk border. It passes through the parish of Hellington before reaching the village of Thurton where a 40 mph speed limit is in force, after passing the grounds of Langley School it bypasses the village of Chedgrave and the market town of Loddon, crossing the River Chet in the process. The route formerly passed through both of these settlements, the road passes the edge of the village of Hales at the junction of the B1136 for Great Yarmouth. Between Hales and Stockton several old stretches of the route can be seen in what are now laybys and it reaches the A143 at a roundabout with the route to Bungay going west. The road briefly becomes the A143 for around 1 mile before another roundabout on the edge of Gillingham where the A143 continues to the north-east towards Great Yarmouth. A service station and fast food restaurant are located at this junction, the road bypasses Gillingham and crosses the River Waveney, passing into Suffolk, before reaching the northern edge of the market town of Beccles at a roundabout with the A145. The road passes to the north of Beccles and crosses the Lowestoft to Ipswich railway line at a level crossing and it passes Beccles Common and to the north of Worlingham, travelling now in a more easterly direction. The villages of North Cove and Barnby and bypassed to the south before the road reaches the edge of the Lowestoft built up area at Carlton Colville, a relief road, the A1145, links Carlton Colville with the centre of Lowestoft whilst the A146 continues east. The A18 is a road in England that links Doncaster in South Yorkshire with Ludborough in Lincolnshire, via Scunthorpe. It meets the A638 at the Sidings Roundabout becomes Carr House Road, overlapping the A638. At the Racecourse Roundabout in Belle Vue, the A638 leaves to the right, and the road becomes Leger Way, passing the Doncaster College for the Deaf on the left, and Doncaster Racecourse on the right. Near Intake, it becomes single carriageway, which it continues as for most of its length until it reaches Scunthorpe, on the right is Danum Academy and Sandall Wood School, a special needs school. There is a roundabout with Armthorpe Road, with Wheatley Hills to the left, at the Sandall Park Roundabout the road meets its old route and becomes Thorne Road. At the Shaw Lane Roundabout it meets the A630, with exits for Shaw Lane Industrial Estate, and the road overlaps the A630 under a railway line. At the next roundabout, on the edge of Doncaster, the A630 leaves to the right, as a road to the M18. The road, now without trunk status, passes Hungerhill School on the left near The Ridgewood pub, there is a roundabout for Armthorpe Lane and Hatfield Lane. It enters Dunsville as High Street, where it passes the Flare Path pub on the right and Dunsville Primary School on the left and it enters Hatfield, passing the Hatfield Chase pub and Ash Hill Academy. It becomes Manor Road near the Blue Bell pub and passes the church on the left. It becomes Epworth Road and meets the A1146 to the left, near Hatfield Woodhouse and it becomes Tudworth Road and passes the Green Tree Brewers Fayre pub on the left, overlapping the A614 from the right at the Green Tree junction. As High Levels Bank, it crosses a flat landscape known as Hatfield Chase, often quite windy. It passes the Black Bull Inn on the right, enters North Lincolnshire and it runs alongside the large North Engine Drain, with the former RAF Sandtoft nearby to the south, next to the M180. It passes the Lincolnshire Golf Club, to the right, at Hirst Priory near Belton, at Crowle, it meets the A161, close to junction 2 of the M180 and Crowle railway station. The A228 road is an important transport artery in Kent, England. It begins at the Isle of Grain and runs in a direction to connect eventually with the A21 trunk road at Pembury. It serves existing communities and new and proposed housing developments and commercial enterprises, the most influential force on the recent upgrading of the road has been the development of Kings Hill near West Malling. The A228 commences on a level crossing at Lower Stoke on the Isle of Grain. It begins as Grain Road, becoming Malmaynes Hall Road after it passes through Stoke running west, passing High Halstow and turning south, it follows Shamal Street which becomes the Ratcliffe Highway, which bypasses Hoo St Werburgh and skirts the Deangate Ridge Golf Club. After reaching Chattenden it turns into Four Elms Hill before switching onto the new Wainscott Eastern Bypass, entering Frindsbury, where the A289 Medway Towns northern bypass starts, it follows Frindsbury Hill and Frindsbury Road before reaching Strood. The southern part of this Hoo Peninsula section was widened in 2005 as part of the Thames Gateway development programme and it is intended to dual the northern section to Grain at a date. In Strood the southbound and northbound routes split due to Stroods one-way system, the southbound route goes along North Road and Knight Road before joining the Cuxton Road whilst the northbound route follows Gun Lane from Cuxton Road to Frindsbury Road. In Strood it crosses the A2, continuing south, the road passes over the M2 and High Speed 1 on Sundridge Hill where those two routes reach land again after crossing their respective Medway bridges. Proceeding down Sundridge Hill, the road descends from the Downs and enters the Medway Gap at Cuxton, at Halling, the A228 departs from the old route that took it through the village and proceeds along the Halling Bypass which links up with the Snodland Bypass near Holborough. As the Snodland Bypass ends the road rejoins its historic route for a stretch on Malling Road which becomes Castle Way as it approaches Leybourne. As it passes East Peckham and the hamlet of Hale Street, the classification A228 was not applied originally to the route south of Mereworth. The A307 road runs 13.2 miles through SW London and NW Surrey. It begins at the junction with the A205 South Circular Road beside Kew Green and it runs towards Richmond upon Thames or Richmond, through the west of Kew. A B-class road, the B353, leaves the A307 in Kew and runs around the centre and up Richmond Hill and by-passing Richmond. It bisects the north of the town becoming the western half of the one-way system in Kingston upon Thames. Here it is merged with the A308. It leads south to the end of the A240, for 200m travels west to the River Thames. It runs next to the River Thames, heading through Surbiton and it passes a junction with the A243, shortly before exiting the borough at Seething Wells there next to Long Ditton. It forms the High Street of Esher, crosses the A3 by way of a north of Cobham, before terminating near a junction of the A3 in Cobham. Robert Clive diverted it slightly believing it ran too close to his house at Claremont, the Landscape Garden of which remains, a watchmans box that served as a village lock-up, dating from 1787 is next to the Fox & Duck in Petersham. The A38, part of which is known as the Devon Expressway, is a major A-class trunk road in England. The road runs from Bodmin in Cornwall to Mansfield in Nottinghamshire and it is 292 miles long, making it the longest 2-digit A road in England. It was formerly known as the Leeds–Exeter Trunk Road, when this included the A61. 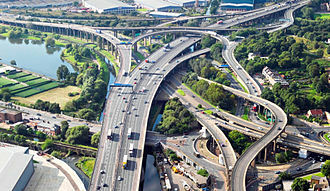 Prior to the opening of the M5 motorway in the 1960s and 1970s, considerable lengths of the road in the West Midlands closely follow Roman roads, including part of Icknield Street. 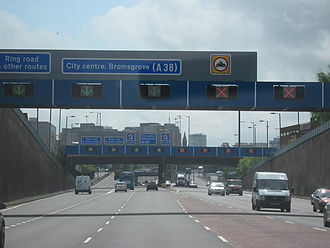 Between Worcester and Birmingham the current A38 follows the line of a Saxon salt road, For most of the length of the M5 motorway, the A38 road runs alongside it as a single carriageway road. The road starts on the side of Bodmin at a junction with the A30 before traversing the edge of the town to meet the A30 again. It travels through the picturesque Glynn Valley to Dobwalls and Liskeard, the Dobwalls section contains the most sophisticated bat bridge yet constructed in the UK. The A38 continues through the Cornish countryside, bypassing the centre of Saltash, immediately after the tunnel the River Tamar is crossed using the Tamar Bridge where the route resumes dual carriageway status. It is 42 miles long and was completed in the early 1970s, there are several grade separated junctions along its length mainly for local traffic, including a three-level stacked roundabout for the A386, which heads out towards Dartmoor National Park. The route was reserved for the Parkway as early as 1943, the viaducts carrying the A38 over the River Plym, which after the construction of the Marsh Mills flyover became the Exeter bound sliproads, were built in 1969–70 as part of the Plympton bypass. This required the road to be closed for only 48 hours, the South Brent bypass opened in 1974 and the Ivybridge bypass in 1973, both on new alignments. After Ivybridge, the route parallels the original route, bypassing the village of Lee Mill which is now home to a large trading estate. The road widens to a dual carriageway for the Plympton bypass. This opened in 1971 and was the first section of the Devon Expressway to be built on a new alignment, the route originally ended at the Marsh Mills roundabout, which when opened was the largest in Europe. The A338 is a major primary route in southern England, that runs from the junction with the A35 at Poole in Dorset to the junction with the A420 at Besselsleigh in Oxfordshire, a distance of 84 miles. The road begins on the edge of Poole by the border with Bournemouth, before heading northward as a grade separated dual carriageway, heading northward up the east side of the Avon, it crosses to the west again near the town of Fordingbridge. It joins the A30 road at St, marks Roundabout, before separating in a north-easterly direction to follow the entire length of the River Bourne. It has a junction with the main A303 road and passes through the town of Tidworth. From there the road north to Collingbourne Ducis, where it twists through the village around the church to a mini-roundabout. It turns right to continue alongside the Bourne through another narrow stretch at Collingbourne Kingston to another mini-roundabout before again heading north. Near Burbage the continued route north to Swindon is designated A346 and it passes through the town of Hungerford, where it meets the A4 road. It meets the M4 motorway at junction 14, passes through the village of Great Shefford and it goes through Wantage where it meets the A417 road, and past the villages of Grove, East Hanney and Frilford. It terminates at its junction with the A420 road near Bessels Leigh,6 miles south-west of Oxford, the section of the A338 south of the A31 to the west of the Avon consists mostly of a relatively newly built road. Part is constructed along the trackbed of the former Ringwood, originally, the A338 went from Ringwood to Christchurch on the east side of the valley, along what is now the B3347. The Bournemouth Town Centre section of the A338 Wessex Way is carried on viaducts across the Bourne Valley. 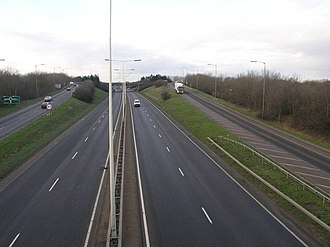 On 21 January 2010 Bournemouth Borough Council imposed a 40 mph speed limit on this section of A338 dual carriageway in an attempt to reduce the accident rate of 198 accidents in four years. In February 2011 it was announced that £20m of funding for repair works on the 6.5 miles stretch south of the junction with the A31 was turned down by the government. The A258 road is an A road in England, running through East Kent from Dover to Sandwich. It is in Zone 2 of the Great Britain numbering scheme and it begins at the A256 within Dover, running up Castle Hill and passing Dover Castle on its eastern side and the Duke of Yorks Royal Military School on its western side. It crosses the A2 at a roundabout at the top of Jubilee Way before running behind the East Kent coast, with turn-offs to Westcliffe, Martin Mill. It runs through Ringwould and Deal, Deal Castle Road leads back to the Ringwould/Dover route. The route heads away from the coast on Broad Street, where it crosses over the high street. It passes over the close to Deal Railway station. Then it becomes London Road heading to Upper Deal, it heads north-west, passing Sholden and Fowlmead Country Park. It is once called the A258, passing through the hamlet of Hacklinge and past the junction to Finglesham. When it reaches the part of Sandwich, near Woodnesborough. In 2006, improvement works were carried out to the A2/A258 Guston Roundabout Junction and this meant the road from Deal was widened at the junction to allow for more queuing on the road. The A15 dual carrigeway in the city centre. The A249 passing under the M2 viaduct. The A249 approaching the Sheppey Crossing from the south. Bridleway bridge over the new Leybourne Bypass. East Peckham bridge over the River Medway. M26 looking east at junction 5. The A21 from Sevenoaks is crossing on the bridge in the foreground.